We’ll discuss ankle joint pain here and on subsequent pages, as well as some of the many causes of it. You’ll learn about the anatomy of the ankle joint itself, the types of injuries and conditions that can afflict this area, as well as ankle arthritis and its causes and symptoms. There are many bones and small joints that make up the ankle and foot. Here we’ll concentrate on the ankle joint itself and the more common reasons for ankle joint pain people encounter in this area. The ankle joint is made up of primarily three components; the tibia (shin bone), fibula (outer “knob” of ankle), and the talus, or “dome” of the joint (which essentially connects the lower leg to the foot. While there are a number of smaller bones and joints that enhance the mobility of the ankle, we’ll center our discussion on the ones mentioned above. The way the ankle is constructed provides for inherent stability from side to side, while allowing full mobility in the up and down directions. This is extremely important, because it provides the necessary flexibility and motion to perform tasks such as walking, running and jumping. The ankle is stabilized further by the addition of special ligaments that “connect” the foot to the lower leg at the points of attachment, the knobs, of the ankle. These attachment points are called the malleoli. The two major malleoli are the lateral malleolus and the medial malleolus. The medial malleolus is the inner knob, and part of the end of the tibia, or shin bone. The lateral malleolus is the outer knob, and is a long bone separate from the shin, called the fibula. The fibula runs the entire length if the tibia (shin) along the outer, or lateral, aspect of the lower leg. It is considered a non-weight-bearing bone, and primarily serves as attachment points for muscles and ligaments. Ankle joint pain caused by arthritis, sprains, and fractures are just a few of the many problems people encounter. They are also among the most frequently encountered and most frequently seen in a doctor’s office or emergency room. The ankle joint typically absorbs several times a person’s body weight when walking, and even more than that when running. It goes without saying the ankle is a workhorse of a joint, and that trauma, excessive body weight and/or repetitive overuse are major culprits when it comes to ankle joint pain and causes of degeneration or injury. Some of the most common ankle problems/injuries that people encounter are ankle sprains. They can be a major cause of lost work time, lost time in sports and an overall hinderance to mobility. Treating ankle sprains can range from simple ice and rest, to surgical repair. Ankle fracture. It is frequently seen in sporting injuries and falls especially during icy, winter weather. 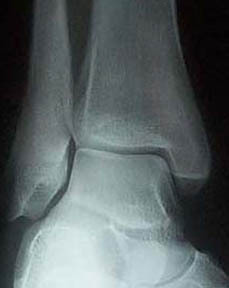 These injuries can range from the minor fracture, for which treatment is fairly basic, such as ankle braces, splints or casts, to the major ankle fracture that can include dislocation, in which case surgical intervention is mandatory to correct deformity and restore the integrity of the ankle joint proper. Most symptoms involving ankle injuries include pain, swelling and, in more severe ankle fractures, some level of deformity. There can be considerable bruising (ecchymosis) about the ankle with inability to bear weight. Mobility can be severely affected. For the most part, ankle sprains are typically treated with ice, pain medications, various types of ankle braces and wraps, perhaps crutches, and occasionally surgical procedures for the most severe injuries. Ankle fractures, depending on their severity, can be treated by ice, immobilization, protected weight bearing and elevation in the milder injuries. In the more severe fractures, and when the ankle joint surface is disrupted, surgical stabilization is needed to reduce the potential for post-traumatic arthritis. These procedures typically consist of restoring the bones and joint surfaces to normal alignment, and stabilizing them by using various types of hardware such as screws, plates and pins. Ankle arthritis , and ankle joint pain associated with it can cause many of the same symptoms as sprains and fractures, but often times the treatment options can be different, and somewhat limited. Sometimes the treatment goals will be quite different than with other injuries and conditions.